I know it’s a little bit early to start talking about that big festive event that is coming up in a few months but us makers start thinking about it when the summer is still with us (ok, that’s normally rain here in Scotland but it’s a bit brighter and not quite as cold). 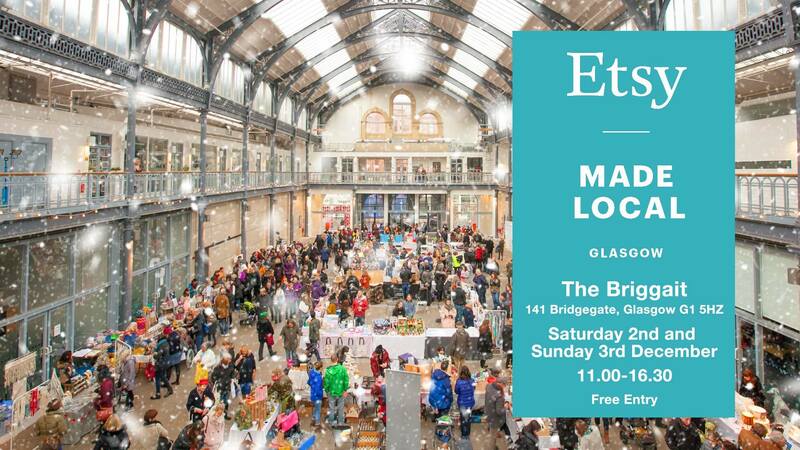 The Etsy Made Local application process for 2017 took place back in July and after having such a great experience last year I was keeping everything crossed that I’d be one of the lucky squad selected to represent the Glasgow Etsy team again this year. I found out at the start of this month that I have been allocated a stall again this year. You can find me there on Saturday 2nd December with all of my usual products plus some festive specials. If you are a super organised person then you can order on my Etsy shop and use code EML17PICKUP to let me know that you want to pick it up at the market. I’m not doing many markets this year as I am busy juggling a full-time job, my Etsy shop and some home renovations so this might be your only chance to catch my in person.